MILWAUKEE – The newest lids from the Harley-Davidson® MotorClothes® Black Label Collection reprise classic 1960s and 1970s style with modern technology. 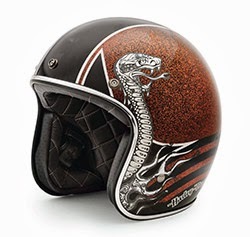 Manufactured by Bell, both the men’s Black Label Black Diamond 3/4 Helmet (P/N: 97274-14VM, $175) and Black Label Slither 3/4 Helmet (P/N: 97273-14VM, $175) feature a fiberglass shell and a fixed, soft inner liner with anti-microbial treatment. 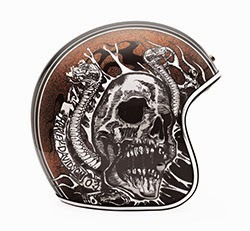 Their vintage-inspired, vivid metal flake paint is highlighted by full chrome trim and custom graphics. Each meets DOT requirements and is available in XS — XL sizes. 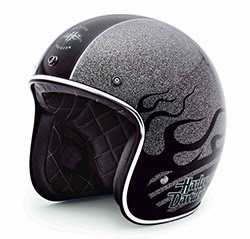 The Black Label Helmets are available now at most Harley-Davidson dealerships.